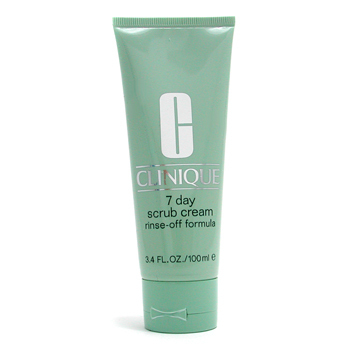 7 Day Scrub Cream Rinse-off Formula Clinique - Be Glossy In and Out! Today I will make review to the Clinique 7 day scrub rinse-off formula which I received with the purchase of serum dark spot corrector. As an aside I would like to tell you that the treatment goes well, I am satisfied and I noticed that the dark spots are lighter. I admit that is the first time that I do not abandon the treatment. Now let me tell you about the scrub. Fine grains in a cream base suitable for all skin types. De-flakes, polishes, clears pores, refines and helps lessen fine lines. Helps control oil-related problems. Use morning or night on a makeup-free face. Massage with finger tips in a circular motion until cream turns clear, avoiding immediate eye area. Rinse or tissue off . Can be used on lips. Cool! I've used this before too and enjoyed it. I forgot about it too, so thanks for reviewing!! You welcome:) Glad you,ve tried it and liked it!! Ohh yes, it,s a great product!! would try it, thanks for sharing your opinion, dear!